Just after Everton had equalised in January’s FA Cup game, as my elation ebbed and the brief flurry of serotonin that had flooded my brain began to dissipate, natural Blue pessimism reasserted itself. With 20 minutes to go, I nudged the Red who was sat next to me, pointed to the tele and said ‘Van Dijk, header, 83rd minute’. Although not completely accurate, my prophesy wasn’t far off (missing out by a few minutes). I’m no Nostradamus but when it comes to Derbies, there is a predictability to events that can give Blues a degree of foresight that could seem almost supernatural to outsiders. In reality, this is simply borne from years of experience. With 20 minutes to go and Liverpool’s expensive debutant still on the pitch, in my jaundiced mind it seemed obvious that (1) he would score and (2) do so at a time that would make a fight back exceptionally unlikely. That’s the point we have reached now with Liverpool. Our games have become almost boring in their predictability. While occasional surprises do occur (and I’m thinking here mainly of Rooney’s penalty), they are increasingly rare for us Blues. Far more common instead are events like Van Dijk’s goal, Mane’s winner and Gerrard’s hat-trick. As fans, we sort of know what might be coming before a ball has even been kicked. With such predictability now attached to the game, perhaps, as supporters, we should stop caring so much? If a disappointing outcome is so frequently experienced, why expend such a high degree of emotional energy into these fixtures? This is no defeatist cry, no desire to stop trying because ‘what’s the point?’ I still want Everton to win and I still want the team to perform well if they don’t. But I want that every week. Why want it more just because it’s our neighbours, and specifically because the likelihood that all that stress, anxiety and worry being worth it is so abjectly low. Every Derby we whip ourselves into a pointless fervour. Our emotional investment in those games far outweighs what we put into any others. And we do it secure in the knowledge that come full time, we will likely feel like crap. Is it worth it? Might it not be better to treat the Derby like any other game? Aside from less heartache, there are also other gains to be had if we stopped giving so much of a s**t about the Sh**e.
Take a minute and think about all the characteristics that you loathe in a football fan. I’m no mind reader but I bet that ‘qualities’ such as smugness, a sense of entitlement and a lack of perspective will feature. Equally, if you took time to think about the elements of a football club that you don’t like, things like a corporate mentality, a tourist fanbase and a manufactured sense of ‘fandom’ might pop up. What’s being described here is Liverpool and its fans. And it’s these fans and this club that we have to engage with because of an accident of geography. How nice would it be if we simply stopped? Imagine caring less about the Derby and treating both it’s build up and aftermath in the same way that you would a fixture against Burnley. Imagine not engaging with their taunts, their gloating, their enduring smugness. They are unquestionably the worst fans in the country. Why the f**k should it be us who have to constantly put up with them. We’ve done our shift, surely it’s somebody else’s turn by now? And the benefits don’t end there. In an era when the Sh**e have been eclipsed by former peers and clubs that were once lesser lights, the Derby has grown in significance for them. When you are no longer a big deal on the national or European stage, it gives comfort to Reds that they can still be kings in their own backyard. And for the all the claims that they aren’t bothered by Everton, just a casual glance at the social media feeds of the likes of the Anfield Wrap, This is Anfield and The Redmen around Derby time will quickly dispel that notion. They absolutely care and for them the victory in the Derby is often the highpoint of the season. And part of what make their victories taste so sweet is our reaction. To watch your local rival visibly crushed is one of the sweetest feelings in football. If we as fans were a little less bothered, then we take this away. What you ideally want is a win against Everton being no more satisfying to the Sh**e than a win against Brighton or West Brom. For those reading who believe that local rivalries are an enduring and indelible part of football life, and therefore we should always place the Derby as a match above all others, consider this: Football has changed beyond recognition over the past twenty years. The ‘Liverpool’ that we once rivalled no longer exists. For over a century, both Merseyside ‘giants’ were local clubs, rooted in the community and reflective of it. As such, a rivalry on geographic terms made sense. But while Everton can still be said to adhere to the old model, the same cannot be said for the corporate monstrosity that resides across the park. 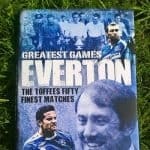 And if you want proof of how little Liverpool are rooted in the community, imagine picking up both Anfield and Goodison and relocating the stadiums somewhere else in the country. For Everton, the impact would likely be disastrous. For Liverpool, the impact would be negligible. Norwegians, South Koreans and the Irish would flock to Anfield, no matter where it was. Liverpool are a ‘Liverpool’ club in name alone. There is nothing ‘local’ about them anymore and so there is no reason for them to be our local rivals.